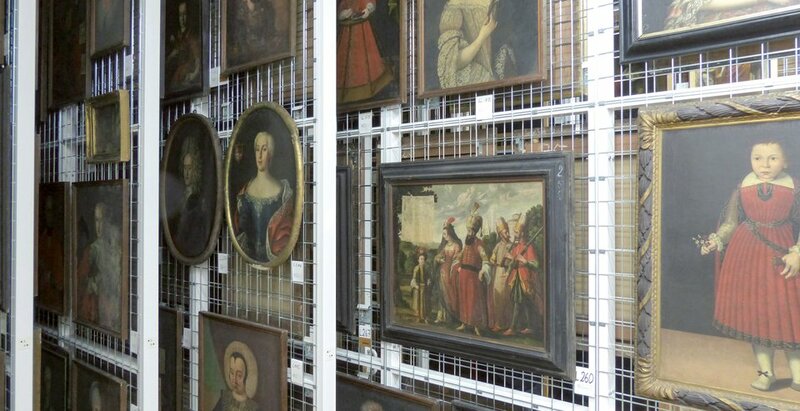 The project will examine and catalog, from different methodological perspectives, a rich but hitherto completely unresearched collection of paintings at the State Museums of Berlin, the »Lipperheide Costume Library.« This collection includes around 700 artifacts of fashion and costume history from the period 1450 to 1900 and has been housed in the Art Library of the State Museums of Berlin since 1899. To date, this collection has not been investigated from a scholarly perspective, despite its immense significance for cultural history. Due to the collection’s thematic and material complexity, such an investigation can succeed only in an interdisciplinary format. This exemplary interdisciplinary investigation will be realized here for the first time in collaboration between the Federal Institute for Research Materials and Testing (BAM), HU, and the Art Library. The participating disciplines include restoration and conservation studies, materials science, art history, computer science, and interaction design. At the same time, we will draw on ethnological and empirical cultural studies as well as costume-history competencies that are the expertise of collaborators and additionalpartners. From the perspective of the individual disciplines, extensive research has been performed in the areas of museology and collection history, as well as art, culture, fashion history, and materials research. Such research has produced a large number of digitization projects and individual research campaigns. However, projects such as the DFG »Typology of the Drawing« (BAM, Klassik Stiftung Weimar), which facilitate work with artifacts in interdisciplinary networks, are the exception rather than the rule. Moreover, neither the natural sciences nor the humanities have the expertise necessary to operationalize interdisciplinary theory as a practice in work with material objects. Special emphasis will be placed on the collection in terms of its function as a set of physical objects and its virtual development and representation. The collaboration between different disciplines will thus foster innovative experimental processes for cataloging other collections; the paintings of the »Lipperheide Collection« will become a test case and model. Our inquiry will focus in particular on the intellectual and technical conditions and procedures of this type of collaboration. The project will investigate how a collaborative cataloging project changes the status and public perception of a collection and how improved knowledge of these objects and materials facilitates the development of appropriate restoration concepts, which themselves contribute to an expanded understanding of the objects. Through these activities, the collaborative undertaking of BAM, HU, and the Art Library will acquire the status of a forward-looking, pioneering project. An individual artifact from a cultural-historical collection is by nature complex and heterogeneous; it manifests a rich object history (archaeological/art-historical provenance, as well as its material history, its collection history, and its restoration history) and its materiality can be described in many ways. Perspectives on the artifact can vary in accordance with the various participating disciplines, so that different types of information are processed from the same primary source. Traditional approaches have not sufficiently acknowledged this complexity. and development and design of a multidimensional data storage unit with the participation of communication and interface design. All participating researchers will be involved in the creation and establishment of the parameters for data storage. The Department of Computer Science will direct the modeling of the open data repository, with the support of the KH Weißensee and in close exchange with the project »Shaping Knowledge«. The project will pursue and publish a model for the collaborative cataloging of cultural- historical collections. Research results will be published not only on the Internet, but also in a symposium with an accompanying exhibition in the Kulturforum am Potsdamer Platz and in a book project in collaboration with the Art Library. The holdings of the Lipperheide Collection, which have been inaccessible until now, will thus be accessible to the public. de Günther, Sabine/Zitzlsperger, Philipp (eds.) (2018): Signs and Symbols. Dress at the intersection between image and realia. Berlin: de Gruyter. Hahn, Oliver (2014): Results of non-destructive Instrumental Analysis. XRF-, FTIR-Spectroscopy and Microscopy. In: Bredekamp, Horst (Hg. ): A Galileo Forgery: Unmasking the New York Sidereus nuncius. Berlin: De Gruyter, S. 77–87.